Virgin Malaysian hair is light, silky and lustrous in texture which is one of the reasons that it’s one of the most popular types of virgin hair extensions on the market. What is the difference between our Princess Virgin hair and the Royal Remy hair? -Virgin Hair: Has not been touched or tampered with by chemical process. It can last 12 months or longer (guaranteed*) . All Virgin hair can be colored. It is best to get the hair colored by a professional. -Remy Hair: Has been dyed to a 1B for color and treated for texture with steam. Remy has typically last for 6 months or longer(6 months guaranteed). 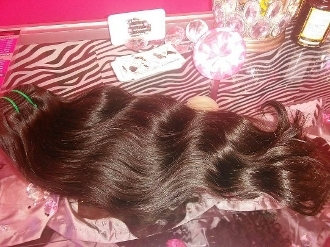 Remy hair, which is no longer virgin because it has been colored .You can darken the hair but it can not be lightened.